Progressed planets speak of inner development that needs to find expression in your outward life. They describe what kinds of attitudes, understandings, needs, and tools you’re adding to your repertory as you evolve over time. It’s important that you learn to weave how you’re changing on the inside into your outer life. Progressed planets coming into contact with your natal Chiron reveal a need to be more aware of your energetic and emotional sensitivity. You’re being invited to evaluate when and why you are and are not willing to be vulnerable, as well as how related attitudes from childhood about feeling safe, supported, and loved might have caused you to make decisions about the whens and whys. Ultimately, with one of these progressions you need to soften your defenses against others’ pain and suffering as you learn to deal more effectively with your own. Conjunctions infuse energy into your Chiron, filling it with stimulation from the inside out. Sextiles trigger and poke your Chiron, sometimes not stopping until you respond. A key is to choose conscious intentions. Trines send a boost of energy that will make louder however you experience your Chiron. The opportunity is to grow through a supportive infusion of energy, but you can also use the trine to establish or give into complacency. Oppositions bring a challenge or confrontation, revealing to you something about how you use Chiron energy so you can see how to let go of the old and step into better, healthier patterns regarding how you deal with emotions and energetic sensitivity. 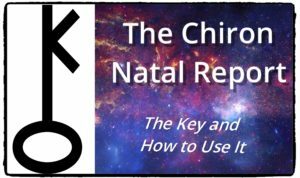 For the full story on your Chiron placement and current transits and progressions, get the new Chiron Natal Report. Progressed Sun aspecting your natal Chiron is a call to revisit and rework how you’ve built and maintained a sense of self by admitting more about your emotional and energetic sensitivity and vulnerability. Your evolving sense of being a coherent human now rests upon not just feeling more, but adding in more awareness of the reality of human feeling and vulnerability into how and why you make decisions of all kinds. The center of your personality and seat of egoic function is now ready to grow by learning through vulnerability healthier ways to define who you are. Progressed Moon in aspect to your natal Chiron brings a need to begin looking in new ways at what you need and why you need it. Your emotional health now requires that you grow through both judgments of your needs and the fact that you have needs and learning more about caring for yourself and meeting those needs. Issues from childhood nurturing are sure to come up during this progression as inner parts of you need to let go of your parents and other loved ones as responsible for loving you in the ways that you need. There’s nothing wrong with asking for what you need, but you need to be clear about what it means when others can’t or won’t meet them. Will you believe you’re not worthy of love, or will you take the opportunity to grow into more self-validation and self-care? Progressed Mercury making contact with your natal Chiron is about in some way (which aspect will tell the full story) bridging your mental self with your feeling and sensitive self. Your linear, logical mind can feel challenged to open up to new sources of information that you (ahem, it) would never want to consider. An example would be someone telling you something and as you hear the words from his or her mouth, you can feel the energetic subtext, or what’s going on under the surface, in that person. You’re being asked now not to wonder which info source you should listen to but to learn to value both. You may become more curious about wounding and healing, and you’ll definitely need to learn a new vocabulary for what makes a human a human. Along the way, you can become good at articulating your own feelings and needs – if you’re willing to let emotions be as important as words, ideas, and plans. Progressed Venus represents how your values and self-esteem are evolving over time. It also has to do with relationships, which always reflect them, as the people in your life are walking advertisements for what you’re willing to experience (put up with?) in and deserve from relationship. In convo with your natal Chiron, it is inevitable that your relationships and values are moving in new directions. It could be that you’re much more sensitive now to the needs of others and needs to set some boundaries in existing relationships about what you will and will not be able (for reasons to do with sanity and health) to offer others. It can also happen that you open to feel more about the suffering and pain of others and seek to begin doing new things to attempt to address them. Expect that you yourself will tap into new levels of what you perceive you need from others, and may find out from them that they now need to develop new boundaries, too. Progressed Mars contacting your natal Chiron says that you’re ready to develop courage to face your wounding, vulnerabilities, and insecurities – and own them. You’re likely to find yourself wanting to take advantage of an opportunity to create something in your life that you really want but be afraid of things not working out. This is a time for you to own your desires and factor in your fears of rejection or failure, while not believing that you shouldn’t act just because something might not work out as you want, plan, or need. These progressions are about inspiring you to act while not forgetting your sensitive nature, and this could call on you to need to be clear in new ways and on new levels about what in your life is okay and what is not okay. In other words, your inner warrior now needs to learn to say “yes, please” and “no, thank you” while remaining in touch with your sensitive, human side. Progressed Ascendant/Descendant axis has to do with how you show and how you relate to others. Aspecting your natal Chiron, it’s time for you to evaluate your expectations both of yourself and others when it comes to how relationships are supposed to work. In some (and depending on the particular aspect) this will require that they begin to spend more time alone in order to get a handle on their own emotional subtext and issues while temporarily limiting how much emotional input and exposure from others is welcome. For others, this will ask them to be willing to open more to others for asking for and giving help, realizing that healthy give-and-take requires two healthy, grounded people who’ve taken responsibility for their own wounded inner kids/rejection fantasies and want to come together as mature adults, not unhappy kids desperate to find out if they’re worthy of being loved. Either of these processes will call on you to introduce new choices in order to balance how available you are for others after you learn to be more available to take care of your own needs. Progressed Midheaven/IC axis reveals how your inner-outer life balance is going. You need to create for yourself both a place for yourself in the world and a solid, mature emotional and psychological foundation for yourself, and this progressed axis is about how you seek to do that. Contacting natal Chiron, you might need a lot more time alone to figure out and process your emotions. You might instead realize that you’ve been doing that too much and need to out into the world to do what’s in you to do there. Issues about creating safety, feeling supported by life and family/loved ones, and dealing with emotions including fears and panic could come up during this progression. It could also be that a drive to manifest your passions, ambition, and tapping into change you want to see in the world could be up now. The particular aspect has much to do with what you experience but, either way, your task is to honor both needs within yourself and understand that a healthy balance is the key. Remember that you can’t create a truly meaningful place in the world for yourself if you emotional and psychological foundation isn’t solid and being tended to. 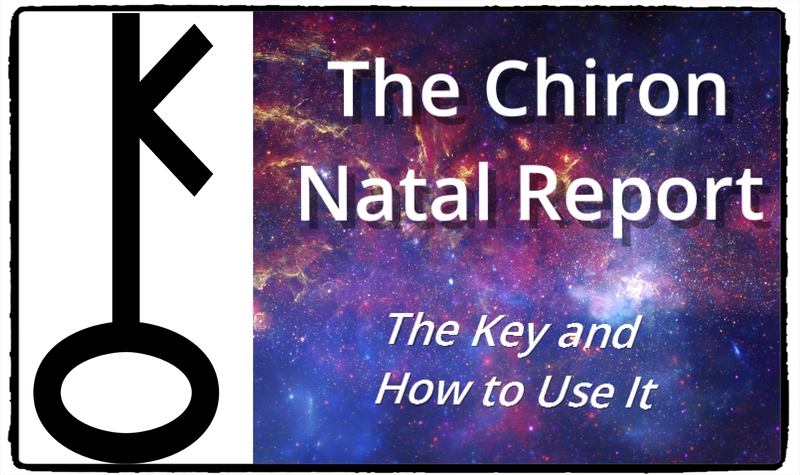 To get the full story on your own Chiron, get your own Chiron Natal Report. It begins with in-depth info on the myth and how we live the archetype, as well as the astrology of your Chiron: house and sign placements, natal aspects with planets and angles, transits and progressions to your natal Chiron, and transits of Chiron to other placements in your natal chart.